Cardinal George Pell (center) at a news conference at the Vatican on Wednesday. After a sweeping overhaul of the Vatican’s financial operations on Wednesday, one thing seems clear: If Australian Cardinal George Pell fails in getting the Vatican, as he puts it, “off the gossip pages” due to chronic financial scandals, it won’t be because the 73-year-old prelate lacks the power to do the job. One way or another, changes announced Wednesday bring most of the Vatican’s important financial centers under Pell’s influence, including purchasing and human resources as well as administration of the Vatican’s several billion dollars of investments. They also place Pell confidantes in key positions. • A downsizing of the troubled Vatican Bank, formally known as the “Institute for the Works of Religion”. Administering investments from its estimated $8 billion in holdings will be taken over by a new Vatican Asset Management office, reporting to Pell. • The “ordinary section” of the Administration of the Patrimony of the Apostolic See (APSA), responsible for personal and procurement, will be transferred to Pell’s Secretariat for the Economy. • Appointment of French businessman Jean-Baptiste de Franssu as the bank’s new president. From 1990 to 2011 de Franssu was an executive with Invesco Europe, an investing firm with $35 billion in assets under management. • Appointment of one new member to a body of cardinals governing the bank, and of several lay people to a board of directors responsible for routine oversight. • Creation of two commissions to study the sustainability of a pension fund for the Vatican’s roughly 5,000 employees, and a reorganization of media activity expected to result in a downsizing and greater emphasis on social media. In an exclusive interview with the Globe on Wednesday, Pell insisted that the reform called for by Francis is “moving in the right direction,” but also conceded he’s run into resistance, perhaps especially among an Italian old guard that feels its power slipping away. 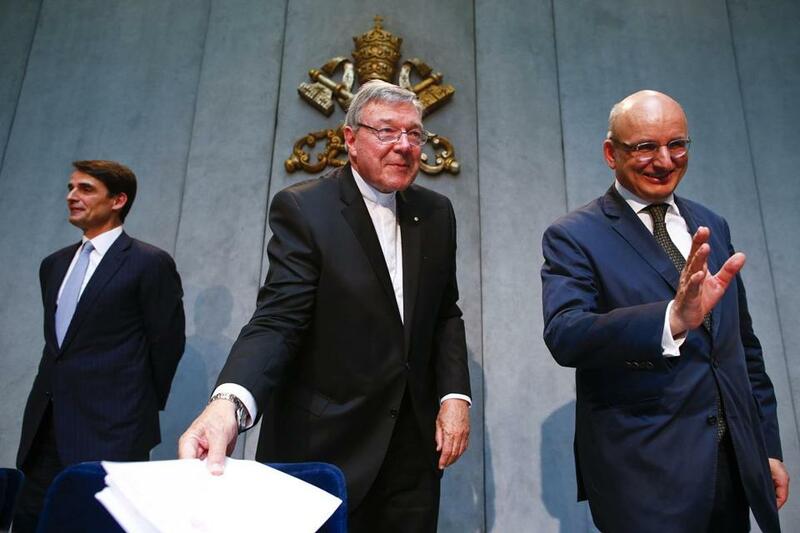 “There’s sadness and a bit of antagonism in some quarters, that’s for sure,” Pell said. As an example of that blowback, Pell shot down recent reports in the Italian press implying that de Franssu, the new bank president, along with two other members of a new Council for the Economy, form a lobby attempting to take control of the Vatican’s money. The following are excerpts from the Globe’s interview with Pell. Globe: In a big-picture sense, what are you trying to do? Pell: The idea is to introduce modern accounting standards, to strengthen transparency, to increase self-sufficiency and coordination, and eventually to generate more income with lower costs. Basically, the ambition is to be boringly successful, to get off the gossip pages. The aim is to become a model of good practice in financial administration. Along the way, we’re not going to generate any less revenue for the works of the Church. We’ve also got to be careful that we preserve the Vatican’s patrimony, so we don’t put anything at risk with short-term moves. You’re confident you can pull it off? We’re certainly moving in the correct direction. The power of your Secretariat for the Economy has been enhanced. Is it fair to say that if reform fails, it won’t be because you don’t have the tools for the job? First I’d like to make a clarification. The whole system is devised to include checks and balances and a division of powers. For instance, I have to answer to the Council for the Economy, rather than it being just an advisory board for me. There are senior, competent, international lay people on these boards, who are much more likely to insist on proper procedures and an appropriate level of independence. We’re not endeavoring to centralize the system. Having said that, we do now have the authority to implement these systems. We’ll continue doing it as long as Pope Francis is with us, and right now he’s looking extremely healthy. We need to set up APSA [Administration of the Patrimony of the Apostolic See, which currently administers the Vatican’s real estate and investment portfolio] as the Treasury of the Holy See. We need to get the Vatican Asset Management office up and running. We have to appoint an independent auditor, which is a very important consideration, which we’ll try to do before the end of the year. Beyond those things, we need to get leaders into the new positions that have been created, and we have to persuade the many good people in the Vatican to cooperate. How is the cooperation so far? It’s not going too badly at all. Most of the people in the Vatican are thoroughly good, and they realize that in many ways the old world couldn’t go on. We’ve promised to consult with them and to share information with them, and most are responding well. I spoke this morning with the staff of the ordinary section of APSA, and they seemed genuinely pleased to see me. It was a contrast with the first time I met them, shortly after I was appointed in February, when they were very cautious indeed. What about blowback from an Italian old guard? There’s sadness and a bit of antagonism in some quarters, that’s for sure. By listening to their complaints and explaining what we’re trying to do. We also need to make sure there’s a significant percentage of Italians in the new leadership, because we’re very dependent on their cooperation. In general, we’re trying to spread accurate information and to dialogue as much as possible. Actually, I suspect the extent to which we’re putting information is something of a novelty. Where will the new Vatican Asset Management office be located? We’re not quite sure, whether it will be with the Vatican bank, with APSA, or somewhere else. De Franssu has said that it’s a work in progress. … Over time, the asset management office will come to manage the Vatican’s reserves, meaning monies not needed for day-to-day operations. To whom will it report? It will answer to me. The ambition is that by putting the various funds together, we’ll have a bigger base sum and be able to get a better return. If we get it going well, I suspect quite a number of people will want to join us. Religious congregations and dioceses … it’s not envisaged that individuals will be able to join. One point to clarify is that we’re talking about managing investment of assets. Ownership will remain with whoever currently owns the funds. What sort of staffing will it require? I don’t know. I imagine a percentage will be brought in from other places around the Vatican, beginning with the bank and with APSA. What does it mean to say that APSA will become the “treasury” or “central bank” for the Vatican? It means they’ll be responsible for keeping a supply of cash coming into the Vatican to ensure its financial stability and liquidity. The idea is to make sure there’s enough money to keep the place going. Since the ordinary section of APSA is moving to the secretariat, and investments handled by the extraordinary section are going to the asset management office, what’s left for APSA to do? For one thing, it will still oversee the Vatican’s real estate properties. In general, it will be responsible for ensuring there’s sufficient cash on hand to meet operating expenses. Why was de Franssu chosen for the Vatican bank? He’s got long experience in asset management and understands the world of banking. Although it’s not a primary consideration, he’s also got a very pleasant and charismatic personality. He’s been involved for over a year now with the study commission that was charged with putting together the reform package, so he’s got a pretty good idea about financial management in the Vatican. Will he be the one to get the asset management office up and running? He’ll be one of the prime movers. Reports in the Italian media have charged de Franssu, along with Joseph Zahra of Malta and Francesco Vermilgio of Italy, all members of the Council for the Economy, with forming a “Maltese lobby” seeking to profit from Vatican investments. How do you respond? Those accusations are ‘Alice in Wonderland’ stuff. They’re perfunctory, and the lack of accuracy is extraordinary. De Franssu and Zahra have no joint economic interests whatsoever, and they had never even met before serving on a study commission last year. They’re both busy men who have given enormous amounts of time gratuitously to the Church. [The allegations] are very, very strange indeed. We had a good look at the situation, and decided there’s just nothing in it. Are the charges an example of opposition to reform? I’m not exactly sure. Quite often people don’t like change, and I can understand that. What I can’t understand is why anyone would bother to go to such lengths. I wonder whether there’s significant money involved, [meaning that] perhaps someone regrets that over the last few years the bank and the Vatican generally have cleaned up their act. Such charges wouldn’t be aired if there wasn’t opposition, correct? Yes, that’s true, but the extent and nature of the opposition is a bit of a mystery to me. Over the decades the Vatican has provided such good copy, maybe some people are tempted to believe that [reform] can’t possibly be true. Do de Franssu, Zahra and Vermiglio have your full support? They certainly have my full support. You said the study of the pension fund is designed to make sure it’s still viable in 20 or 30 years. What will that take? I think that within the next 12 months or so, it will require quite a significant injection of capital. It will probably be drawn from the Vatican’s reserves. There won’t be any changes for those currently paying into the system or drawing pensions, but in the long run we have to do something. In some cases in Europe, unless nations change the level of funding their pension systems they’re going to be under extreme pressure in 15 or 20 years, and I don’t want the Holy See’s employees and pensioners to be in that position. Is it fair to say we’ll see a slimmed-down Vatican media operation? I actually hope they’ll expand in some areas, especially into new forms of social media. In general, I’m hoping for a slimming-down and an expansion of the reach of these various organs. How closely is Pope Francis involved in these financial decisions? I can tell you that he’s very interested in getting the basic issues right. He was present for a day and a half of discussion on financial matters at the recent meeting of his Council of Cardinals, and he’s met with the members of the various study commissions. He’s got quite a good grasp of what’s going on. How often do you see him? Every two weeks on a regular basis, and any other time I need to. Was he consulted on the appointment of de Franssu to the Vatican bank? Speaking of the Council of Cardinals, it’s been reported that there was a disagreement over some aspects of the financial reform process. Italian news outlets suggested that Cardinal Giuseppe Bertello, the lone Italian, objected to de Franssu. Is that accurate? We’re not supposed to talk about what went on there, but I’d say that in my fairly long experience in the Church, the Council of Cardinals is quite unusual for its good and friendly spirit. People can express differing points of view quite happily, and the pope is more than content to let that happen. I’m not sure there’s been anything like it for at least the last several hundred years, with a discussion that’s so free and yet without rancor. Of course it’s not a museum, and people sometimes have differing approaches. Are you saying Bertello did object? I’ve said nothing of the sort. De Franssu has received an enormous level of support. In general, I think all the cardinals on the council are on board with where things are going, though in fairness there might be one or two with reservations about some aspects of it. However, there’s very, very substantial support. Anyway, given the system in which we work, the most important figure is the pope. Recently you hired Danny Casey, formerly your business manager in Sydney, to head a new project management office in the secretariat. Some have criticized that as cronyism, saying it’s the same incestuous approach you were supposed to eliminate. How do you respond? There hasn’t been much of that reaction, and it’s manufactured and artificial. Danny Casey has outstanding credentials for the particular role given to him. He ran one of the best organized World Youth Days ever in Sydney, and the archdiocese is very much a going concern financially speaking. He was the first layman to run the money in Sydney, and during his time we were able to do a lot of things while also strengthening the patrimony. Are you just hiring your friends? One swallow doesn’t make a summer. You’ve got to have people in the key positions who can deliver. We’ll use a professional headhunter firm to fill other positions as they come along. Cynics say they’ve seen previous waves of supposed financial reform in the Vatican come and go, and nothing much ever changes. What makes this different? Nobody in living memory has seen anything like this before. What’s so new are the structural reforms. We’ve now got different focuses of authority and checks and balances. We’re also injecting some of the top financial people from around the world into the leadership of these different agencies, and they won’t stay on these boards if the businesses aren’t run properly. We’ve never seen such an injection of lay leadership into the senior ranks of the Church as we’re seeing now with finances. That’s extremely healthy, because it’s an area in which we clerics don’t necessarily have any expertise. Going forward, you won’t be able to change the system back to what it was before simply by changing one person. A whole network of institutions is being set up, with more to come. As you look to fill these roles, are you going to try to find more women? That’s a very strong consideration. If anyone can propose some very talented senior international financial figures who are women, we’d be more than happy to take them on board. John L. Allen Jr. is a Globe associate editor, covering global Catholicism. He may be reached at john.allen@globe.com. Follow him on Twitter @JohnLAllenJr and on Facebook https://www.facebook.com/JohnLAllenJr.